Hello Dance Ability Movement community! As you may know, October is OT month and we are celebrating the wonderful OT’s that make up The Dance Ability Movement! 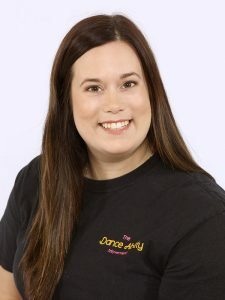 In this post we would like to recognize Casey Cadeau, our primary OT at Elite Dance Corps in Bradford and secondary OT at the Dance Workshop in Alliston. A: I was lucky enough to have it as the last placement of my occupational therapy degree. A: I love seeing how much joy it brings to the dancers and their families. The warm community that the dancers are a part of is really special. A: I love when dancers achieve a new “first”. Whenever a dancer has been working really hard on a new skill and really nail it for the first time, it is just such a magical moment. It can be a dance move, being first to say hello, or even just staying in the circle for a whole song for the first time. It can mean a lot not only to the dancer, but to the parents, buddies and Dance Ability Movement staff. A: I’ve learned how much of an impact the program has on everyone involved. Obviously it is focused on the dancers, however the parents and the volunteers get a lot of out it as well. Everyone has an opportunity to learn, grow, and develop meaningful connections. A: Yes, of course! But it always goes away as soon as the music comes on. A: Warm-up and checking in with all the dancers. A: Clinical Assessment and Practical Interventions for Praxis – From Ideation to Execution. 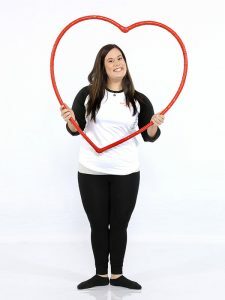 We want to thank Casey for all that she has done and continues to do with The Dance Ability Movement! Her energy and passion is appreciated and we admire all that she does. Thank you Casey!